NEUHAUSEN, SWITZERLAND--(Marketwired - Feb 11, 2015) - Tyco Retail Solutions (www.tycoretailsolutions.com) today announced its fourth consecutive year of revenue growth for its genuine Sensormatic source tagging program. For fiscal year 2014, Tyco earned the highest source tagging revenue in the company's history, with growth in both source application of Electronic Article Surveillance (EAS) labels and recirculation of hard tags. Tyco's source tagging program is the largest in the industry, protecting the most popular consumer products and apparel items at the world's top retailers. Tyco's comprehensive source tagging program encompasses source application of both EAS labels and reusable hard tags. Today, more than half of Tyco's genuine Sensormatic labels are applied by product manufacturers or packaging companies, allowing retailers to quickly deliver items to the selling floor, and reallocate labor to focusing on customers for a more personalized experience. With Tyco's global presence and unmatched source tagging infrastructure, retailers receive cost effective and robust merchandise protection with outstanding results. An industry pioneer in apparel protection, Tyco introduced apparel and textile source tagging with EAS labels sewn into merchandise at the manufacturing source. Tyco initiated another source tagging first with Visible Source Tags (VST) that are affixed to apparel and then recirculated through the supply chain. 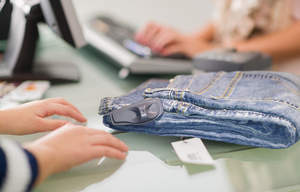 With Tyco's newest dual technology Acousto-Magnetic (AM) EAS and RFID hard tags, retailers can now control shoplifting, and also gain vital RFID-enabled item-level visibility for better inventory management and connection to the Internet of Things (IoT). Gaining immense popularity with retailers, Tyco's recirculated RFID hard tags are a cost effective and environment-friendly approach for deploying full scale apparel RFID programs. "We value our strong industry partnerships with retailers and manufacturers worldwide as we continue to improve product profitability," said Nancy Chisholm, President, Tyco Retail Solutions. "Our network of global retailers across 70 countries relies on Tyco's seamless deployment of source protected merchandise to enhance store operations." Learn more about Tyco Retail Solutions' Source Tagging program. Tyco Retail Solutions is a leading provider of integrated retail performance and security solutions, deployed today at more than 80 percent of the world's top 200 retailers. Customers range from single-store boutiques to global retail enterprises. Operating in more than 70 countries worldwide, Tyco Retail Solutions provides retailers with real-time visibility to their inventory and assets to improve operations, optimize profitability, and create memorable shopper experiences. TYCO and SENSORMATIC are registered trademarks. Unauthorized use is strictly prohibited. Retailers rely on Tyco’s Sensormatic source tagging program to improve product protection and operational efficiency for increased customer engagement.